Stratford-upon-Avon Butterfly Farm Butterfly FarmStratford-upon-Avon's Butterfly Farm is the UK's largest tropical butterfly paradise. Rain or shine, discover many of the world's most beautiful butterflies in an exotic environment of tropical blossom with splashing waterfalls and fish-filled pools. Watch in awe as hundreds of spectacular and vibrantly coloured butterflies fly and feed around you. See the amazing lifecycle of a butterfly in action in the Caterpillar Room. Some of the world's largest and most camouflaged caterpillars are on show with cocoons, giant silk moths and shining pupae hanging on the plants. 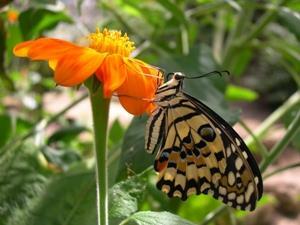 Stratford-upon-Avon's Butterfly Farm is the UK's largest tropical butterfly paradise. Rain or shine, discover many of the world's most beautiful butterflies in an exotic environment. Located on the south bank of the River Avon opposite the Royal Shakespeare Theatre, easily accessible from the town centre, just five minutes walk away. Car parking is available outside the site entrance. Onsite parking for disabled only.